Come Friday March 11th, 2011, the much publicised movie ‘Anchor Baby’ will debut at the Silverbird Galleria in Ghana. One of the highlight of the debut of ‘Anchor Baby in Ghana is that son of the Ghanian soil Samuel Osei Sarpong who has starred in several international movies, including the well known ‘Love don’t cost a thing’ will for the first time in his acting career be bringing down his acting prowess to the Ghanaian soil in ‘Anchor Baby’. The amount of buzz ‘Anchor Baby’ is generating from movie lovers and Ghollywood in general is a solid proof that the Ghanaian people are receptive to it. Producer of the movie Lonzo Nzekwe is presently concluding plans with Pan African to have the movie distributed beyond Ghana to other African countries. A film that had Caucasian, Hispanic, Asian and African characters playing major parts, Anchor Baby tells the tale of a married illegal immigrant couple living in the US, Joyce and Paul Unanga. They have been ordered by the US immigration to leave the country by voluntary departure. They agree to leave; but only after Joyce who is 5months pregnant delivers her baby inside the US. This will guarantee automatic citizenship for their child. Ignoring the deportation order, the couple goes into hiding. Paul was later caught and deported while Joyce stayed back to struggle on her own to achieve their dream. The love, hope, pain and struggle that came with this decision is bound to stir up some emotion in you. 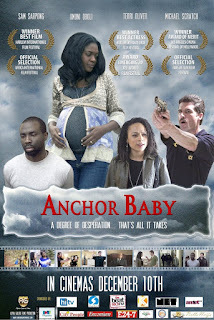 Tagged one of the longest running movie in Nigerian cinemas and the third in terms of gross-revenue, ‘Anchor Baby’ is all set to set fresh records in the Ghanaian cinemas.